Webservice Review 2019: Is Webservice a Good Hosting? Webservice is primarily a white label provider of hosting for website design agencies, and the features are skewed towards those customers. Unfortunately, customer service is lacking and the prices are high for everyday users. 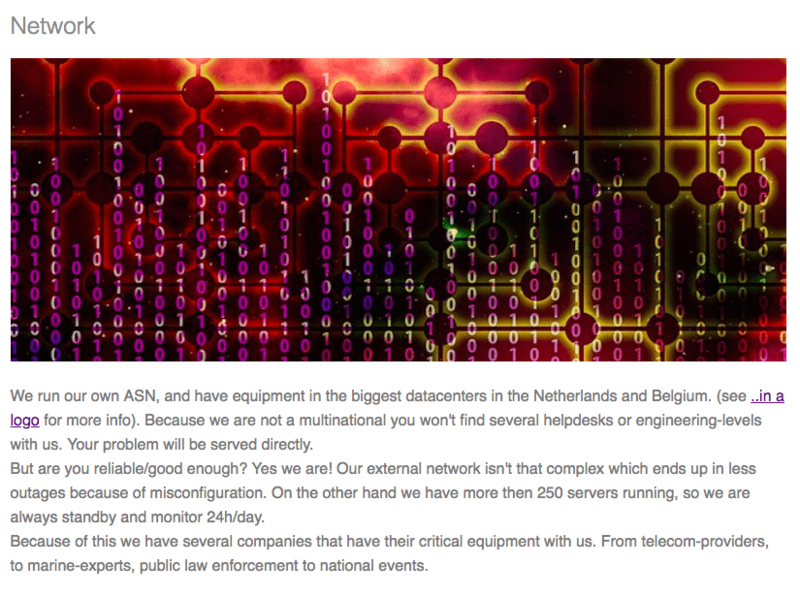 Webservice has been providing Belgium-based hosting since 1998, with approximately 4,000 customers at present. It’s an “internet integrator” selling white label hosting to website design companies. The main website is available in Dutch and English, with the support section in Dutch. Webservice does not own its own data center, instead, it has private-rooms, racks, and colo’s in several data centers in several countries. However, it does manage its own IP’s, routing, and web servers. Unfortunately, there isn’t an uptime guarantee advertised, so I can’t comment on how much downtime you may experience. The servers run on Apache with cPanel, an easy to use control panel, and there are all of the usual features such as MySQL databases, FTP accounts, and compatibility with the usual CMS programs e.g. WordPress, Joomla!, and Drupal. Programming languages include PHP, SSI, and ASP. Webservice seems a bit more hands on than other shared hosting companies, likely because the target customers are other businesses who want to focus on building websites. Therefore, Webservice monitors and assists with the shared hosting environment such as databases, ftp-connections, outgoing-email, load, IO, memory, and so on. While the shared hosting plans are quite rigid in their resource allocations, the reseller plans are completely customizable. Simply select the number of domains, amount of traffic, disk space, email accounts, and build a tailor made package. The pricing for the shared hosting plans seem high, but the issue is compounded by the fact there isn’t any information on how much disk space or traffic is included in the packages displayed on the website. Oddly, the reseller packages seem much better priced, which could be indicative of its customer base made up of website design agencies. None of the plans can be purchased online, which is quite outdated and a bit frustrating. Instead, you need to email the company for a quote. SSL certificates, domain names, and VAT are all added costs to consider (on top of the premium price tag). You can contact Webservice by email or phone only (it’s pretty proud of the fact that it doesn’t use social media, live chat, or VOIP), however, there’s a decent help center with various help documents. It’s worth noting that while the main website is in Dutch and English, the support pages are in Dutch (although translated via a Google plugin easily). My customer experience was limited by the fact I sent the team an email on a weekday afternoon and waited several days for a reply, which never arrived. Webservice has a unique website, which lacks some vital information. However, it’s a long standing business which is in partnership with Effix Internet Solutions. The plans are geared towards businesses who are reselling the hosting to their clients, so the features won’t be sufficient for everyone. Wondering how Webservice stacks up against other Web Hosting companies? Enter any other Web Hosting company and we will give you a side-by-side comparison.